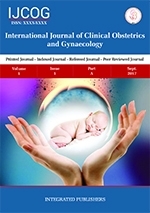 International Journal of Clinical Obstetrics and Gynaecology is a peer reviewed international open access journal, which is abstracted in various reputed databases. The Journal provides the platform with the aim of motivating the researchers in all fields of obstetrics and gynaecology. Abbreviated Title: Int. J. Clin. Obstet. Gynaecol. The journal is indexed in Index Copernicus, Google Scholar, ResearchBib, Geneva Foundation for Medical Education and Research, ICMJE, CrossRef, (NLM) Catalog, Scilit and RJIF. International Journal of Clinical Obstetrics and Gynaecology follows the recommendations of International Committee of Medical Journal Editors (ICMJE). The journal publishes case reports, research and review articles in fields and aspects of obstetrics and gynaecology which includes obstetrics, maternal-fetal medicine, general gynecology, gynecologic oncology, uro-gynecology, reproductive medicine and infertility, reproductive endocrinology, and sexual medicine. Online submission of the manuscript is strongly recommended. A manuscript number will be mailed to the corresponding author within one week or earlier. Prospective authors can submit their manuscripts at gynaecologyjournal@gmail.com. 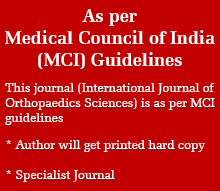 All manuscripts are subjected to peer review process (which are not previously published and are not under consideration for publication by another journal) would be published without any delay in a subsequent issue after acceptance. Read Instructions to Author for more details. On the behalf of the International Journal of Clinical Obstetrics and Gynaecology, I would like to extend my regard to all fellow researchers and scholars and wish prosperity in their field.